colour accent using any of the above. Try to vary the subject matter, including both arrangements (such as a still-life) and found situations. In arranged photographs, you will have the advantage of being able to choose objects and settings that have the exact colours you are looking for. Uncontrolled situations are rather more difficult, and demand more careful observation. Make use of both lighting conditions and filters to help create the colours, but not in every photograph. To accompany these photographs, make notes about the ways in which the colour works in each image, and make a sketch for each to show the balance and movement. As mentioned in my planning post I found this assignment really time consuming. Finding the right combinations of colours in the correct ratio is exceptionally difficult as well. An artist friend once remarked to me that people tend to dress in ways that reflect their natural surroundings and where I live we are surrounded by mountains and ocean, and for eight months of the year we have grey skies and rain, so the population tend to dress in dark (mainly black) and muted colours for the most part of the year (reflecting the mood of the weather in my opinion). It improves a bit during the summer when the sun is out and the flowers are blooming, then we see people in colour on the streets. Originally from South Africa where colours are always visible and vibrant it does take some getting used to. Unfortunately for me, just when I was ready to start working on the assignment portion, the weather changed and the colours were put back into the closets. I eventually settled on a loose theme which was inspired by William Eggleston’s Democratic Forest series (see planning post). With weather fluctuating between drizzle, rain, torrential downpours and the occasional peek of sun, and armed with plastic bags and towel for my camera, I set off to photograph Vancouver in a nonpartisan way, hitting the forests, city streets, industrial alleys, countryside and harbours. I tried to ignore the fact that I was looking for colour combinations, but found that that monkey was often on my shoulder creating problems for me. All post-processing was done in Lightroom 5, with the exception of the creating of the colour balance/abstract images which was done in Photoshop by applying an artistic filter. The corresponding colour balance/abstract images follow directly after my reflections on each image, followed by the movement sketch and an explanatory comment. I am including a colour wheel diagram for reference purposes. Complementary colours are those colours located opposite each other on the colour wheel. 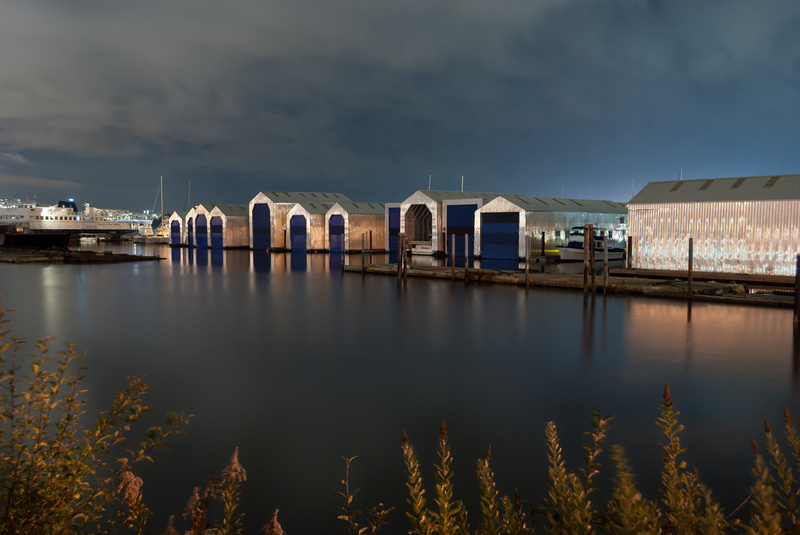 The sun had set and the lights around the Marine Campus had come on and they cast a beautiful orange glow onto these boathouses. I took a long exposure which lightened up the dark sky to a nice blue creating a very pleasing harmony and smoothed out the water. The shrubbery in the foreground had some orange foliage as well which emphasizes the orange glow of the sides of the boathouses and the reflection in the water. The clouds in the sky add a touch of drama to the image. I was very pleased with this image and think it is my favourite of the series. Post-processing consisted of local adjustments to lighten the exposure of the water by two-thirds stops to bring out the reflections and the foliage by a third stop. A radial filter was applied over the boathouses to bump up the exposure and open the shadows a bit and add some clarity. Another radial filter was applied to the shrubs on camera left to lighten the foliage slightly. As can be seen in the image above, the shrubbery framing the bottom of the image draws the eye inwards towards the boathouses, while the boat houses stretch diagonally across the frame converging in the distance close to the ferry. 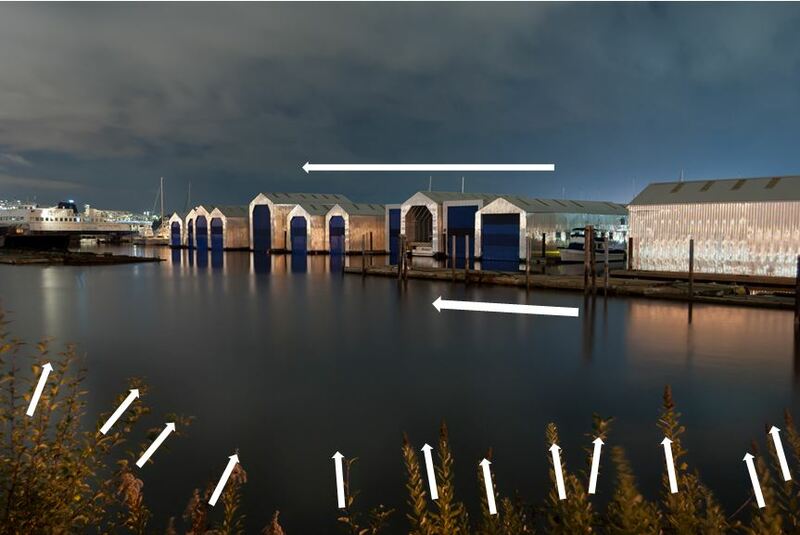 The blue doors of the boathouses form punctuation points along this diagonal line bouncing the eye along from boathouse to boathouse. The image in fig. 02 was taken at the BCIT Marine Campus, where students learn the art of seamanship. 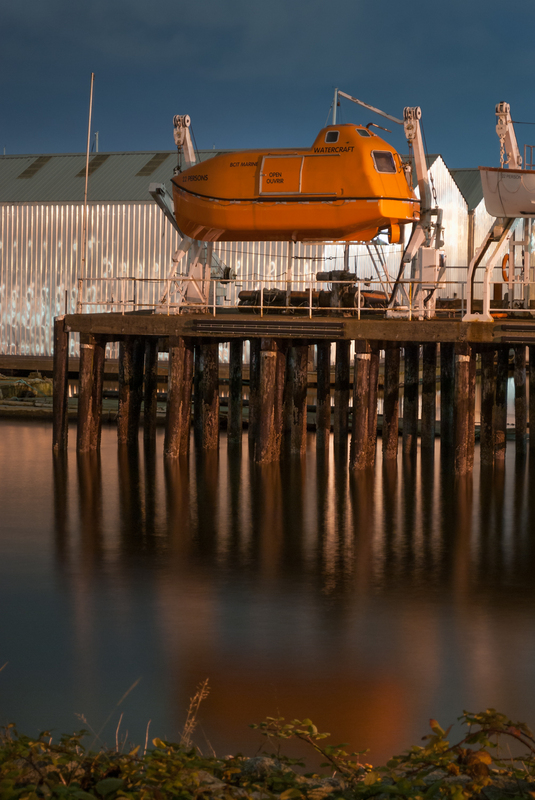 The reflection of the orange lifeboat in the water below caught my eye and with my camera on a tripod, I chose to shoot vertically to give emphasis to the pilings of the pier and make the most of their reflections in the water. 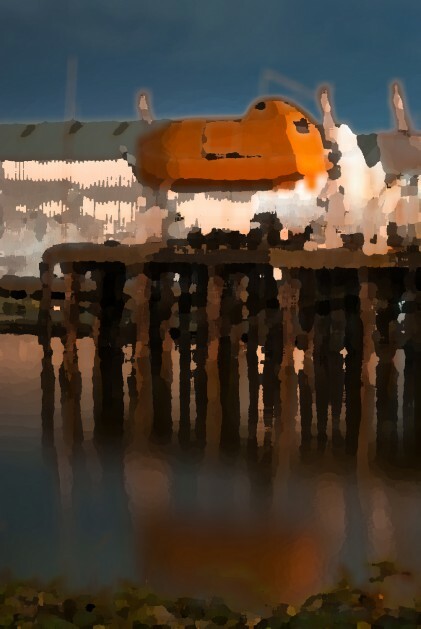 The blue sky and water create a complementary harmony against the orange lifeboat and its reflection in roughly a 1:2 ratio (one part orange, 2 parts blue). The slow shutter speed smoothed out the ripples on the water caused by the breeze to a mirror-like smoothness and the foreground bushes add just a little touch of framing at the bottom of the image and pick up on the orange tones, serving to draw the eye into the frame. Post-processing involved globally bringing up the shadows and adding a pop of clarity. Then local exposure adjustments were made to the shrubbery to lighten them up a bit, the exposure on water in front of the pilings was increased by a third stop and a couple of bright spots had a highlight reduction and exposure reduction applied to them. Then the image was sharpened and a touch of luminance added. The movement in this image (fig. 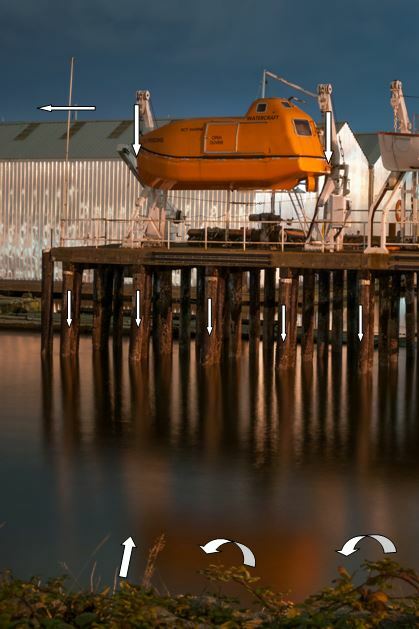 02) is mainly of a vertical nature with the vertical pilings and their reflections and the lifeboat, which is poised for a downward movement in the case of an emergency, with slight undulating curves on the foreground shrubbery which draw attention to the lifeboat’s reflection, with the stability of the horizontal line of the pier’s platform and roof line behind the lifeboat, as illustrated above. Red and green form almost equal parts in this complementary harmony in fig. 03. 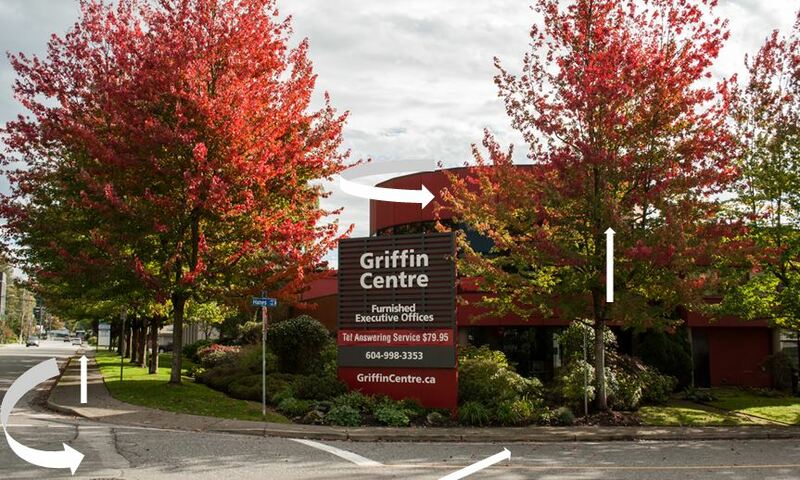 The green foliage of the trees, shrubbery and grass is offset by the maple trees which are beginning to turn red and adding to balance the red is the red curved building in the background and part red sign in the front. In post-processing a bit of contrast and clarity was added, highlights were brought down quite a bit to bring out the detail in the sky and the shadows were opened up a bit too. Locally the exposure on the road and the tops of the trees was brought down a third of a stop. In fig. 03 the trees on the left form a linear perspective off into the distance, while the shadows on the road in the foreground create interesting diagonal movements leading from the edge of the frame inwards towards the tree on the right. The curve of the road on camera left leading to the street is echoed by the curve of the red turret of the building in the background. The trees also provide vertical movement stretching from almost the bottom of the frame to the top edge creating an impression of strength and stability. This was the only yellow-violet complementary harmony that I was able to find (fig. 04). These striking yellow dragons silk-screened onto a violet background flank the original entrance to the Vancouver Art Gallery (the actual entrance has been moved around the side of the building and this majestic entrance is only used when movies are made these days. 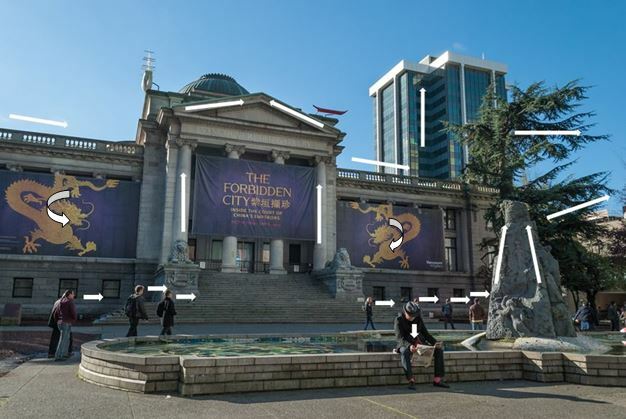 Most movies made by Lionsgate Films and other companies, that feature a court house in them are usually shot on these steps). The title of the main exhibition is hung over the portico’s ionic columns. (The exhibition is on my to do list). The violet hues of the silkscreens are echoed in the man’s jacket (camera left) as well as in the socks of man who is sitting on the edge of the fountain reading a newspaper. His bright socks form the punctum of this image for me. My eyes keep being drawn back to his ankles. A tiny bit of contrast was added to this image in post-processing, highlights were reduced and the shadows were opened up all the way. White and black points were set and some clarity and a touch of vibrance were also added. Local adjustments were made to the front of the gallery to lift the exposure, shadows and add an extra bit of clarity to the building. Exposure and shadows were brought down on the corner of the highrise in the background as there was a spot where the highlights were blowing out. A bit of luminance was added when the image was sharpened. The granite monument in the middle of the fountain is triangular in shape and this is echoed in the triangular shaped portico of the gallery’s entrance as seen in fig 04 above. Both triangles have their base at the bottom, indicating stability. According to Itten (1970, p 75) the triangle ‘is the symbol of thought.’ Quite apt in this case as this building used to be the Provincial Law Courts before it was turned into an art gallery. The wide angle of the lens creates a diagonal line along the roof of the gallery, which is reinforced by the fountain wall below and complemented by the movement of the people walking across the frame to the right. One is also very conscious of the eye-line of the man reading the newspaper (Gestalt Law of Good Continuation), which in turn brings the attention back down to his socks again. The diagonal line of the branches of the tree tend to lead the eye out of the frame and the vertical line of the building in the background is reinforced by the Gallery’s ionic columns, providing elements of strength and stability to the image. Similar or analogous colours are those colours which are located next to or very close to each other on the colour wheel. 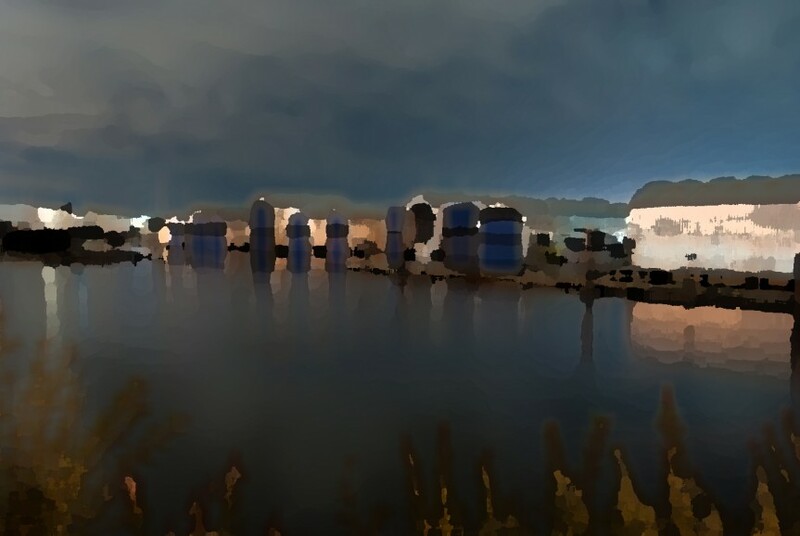 In this image of Deep Cove harbour (fig. 05), there are various tints and shades of the colour green: the bright green of the grass, the lighter manufactured green of the building’s roof, the darker shades of the cypress trees, the lighter tints of the maple trees in the centre of the image and in the distance the blue-green of tree-clad mountains. All these shades and tints of green combine to create a restful image. Green is the colour representative of growth, balance and harmony. It is also classified as an emotionally positive colour (perhaps that is why hospitals used to be painted green back in the day). The various shades of green can be clearly below. Post-processing involved adding contrast and bringing the highlights right down to bring out detail in the sky as it was raining. Shadows were bumped up a bit, and clarity and vibrance added. Local adjustments were made to the tree on camera left to bring out more detail, by lifting the exposure. The clouds also had an adjustment done to drop the exposure by another third stop and bring down the highlights a tad more. An exposure adjustment was also done on the trees on the right to open the shadows a bit. Apart from the obvious vertical movement of the trees in Fig. 05 above, there is also a parallel diagonal movement between the hedge in front of the building and the walkway at the harbour’s edge. The roof is triangular in shape featuring a triangular skylight and triangular portico at the entrance. This structure lends stability to the image and tends to anchor the eye in that corner for a while. I was sitting on a bench near a bus stop on one of Vancouver’s busiest street when this particular bus happened on by (fig. 06). This woman’s red jacket above the orange signage on the side of the bus attracted me immediately, but it was only when I had uploaded the image that I notice the orange stripe above her head. It must have been from one of the internal bus ads. I thought the vertical repetition of the red-orange shades worked quite well. Red is the colour of physical movement and excitement. Only local adjustments were made to this image. There was a bright spot on the side of her sunglasses where the sun was catching the metal and I have toned that down quite a bit. I also reduced the exposure across her forehead to balance out her complexion with the bottom half of her face as this area was too bright because of the sun striking her. I then brought down the exposure and saturation of the yellow grab pole on the woman’s right to avoid the eye going to that bright spot. There really is not much movement in this image, apart from the woman’s eye-line. She is looking ahead in the direction she is travelling. This photo (fig. 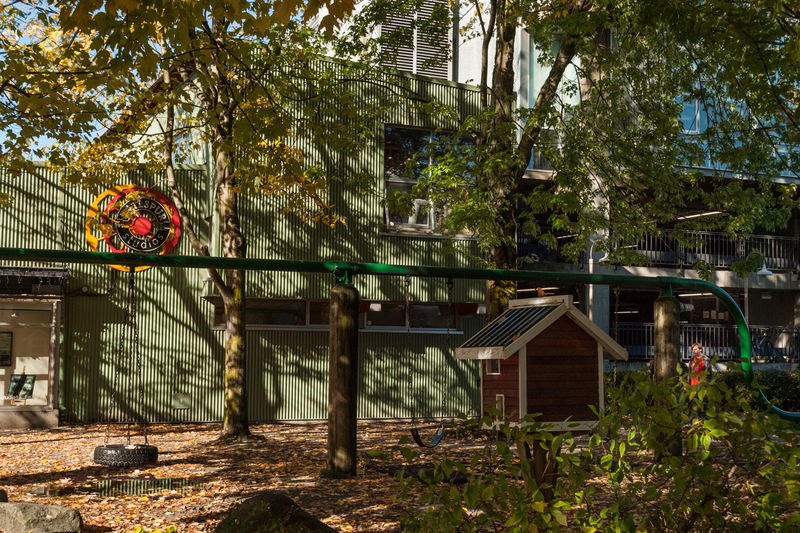 07) was taken on Granville Island, a place where art and industry co-exist on a little island under a bridge. I liked the abstract nature of the rusted, charred and patched corrugated iron wall of the one warehouse I happened to walk past. The analogous colours range from red to orange-red to orange to yellow-orange to yellow, all colours on the warm side of the colour wheel. The graffiti scrawls add an extra element of interest. Post-processing involved adding some contrast, lifting the shadows quite a bit and adding clarity and vibrance. In Fig. 07 there is vertical and horizontal movement as can be seen from the directions of the corrugated iron and paint marks. The beam at the top of the image provides a slight diagonal perspective as does the graffiti on the right of the image. The graffiti on the lower left of the image is more curved in nature and draws the eye in. Coming out of Stanley Park into West Georgia Street (the main thoroughfare of the city) there are three rows of trees lining the sidewalk, all maple trees in autumn colours (fig. 08). I was lucky enough to get here on a day that it was not raining and so set about photographing the boulevard in both directions. It was early in the morning and the sun was just making its way through the clouds so the light in these trees was absolutely fantastic. I wanted to capture the canopy of red-orange foliage above as well as the carpet of fallen leaves on the ground. 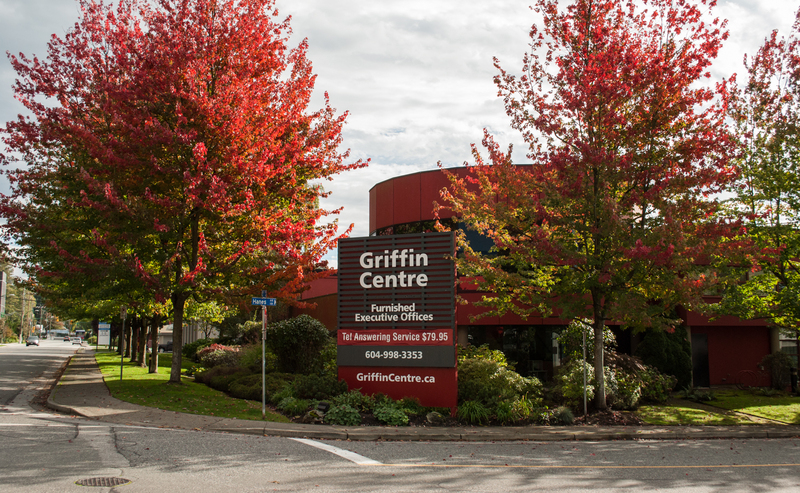 The fall colours are offset by the dark tree trunks and patches of green which show through the leaves, but otherwise the red-orange totally dominates the image. The orange colours create feeling of warmth and happiness. In post-processing I added a small amount of contrast, lifted the shadows slight and set my white point. I then added clarity and a bit of vibrance. Local adjustments involved bumping up the exposure and lifting the shadows slightly on the tree trunks to make some of the bark detail visible. I also brought the exposure and highlights down a bit on the traffic lights and signage. I then applied two radial filters to the canopy of foliage to focus attention on the leaves and I also applied a tiny radial filter on the man (another photographer) in the centre of the frame to add just an extra layer of interest to the image. The most obvious movement in fig. 08 above is the curve of the canopy of red-orange foliage as well as the vertical movement of all the tree trunks. A slight diagonal movement is hinted at with the cement path, but most of the path is covered by leaves, so that is not clearly visible. The group of people standing near the bus stop form a nice circular interlude for the eye to rest on. Itten classifies contrasting colours as being formed of 2, 3, 4 or more hues. They can be dyadic (two colours diametrically opposite each other on the colour wheel – these are our complementary colours. Triads are three hues where their intersecting lines form an equilateral triangle, eg yellow/red/blue. Tetrads are two pairs of complementary colours which when the intersecting lines are joined within the colour wheel form a square or rectangle, eg yellow/violet/red-orange/blue-green. Hexads are three pairs of complementary colours. 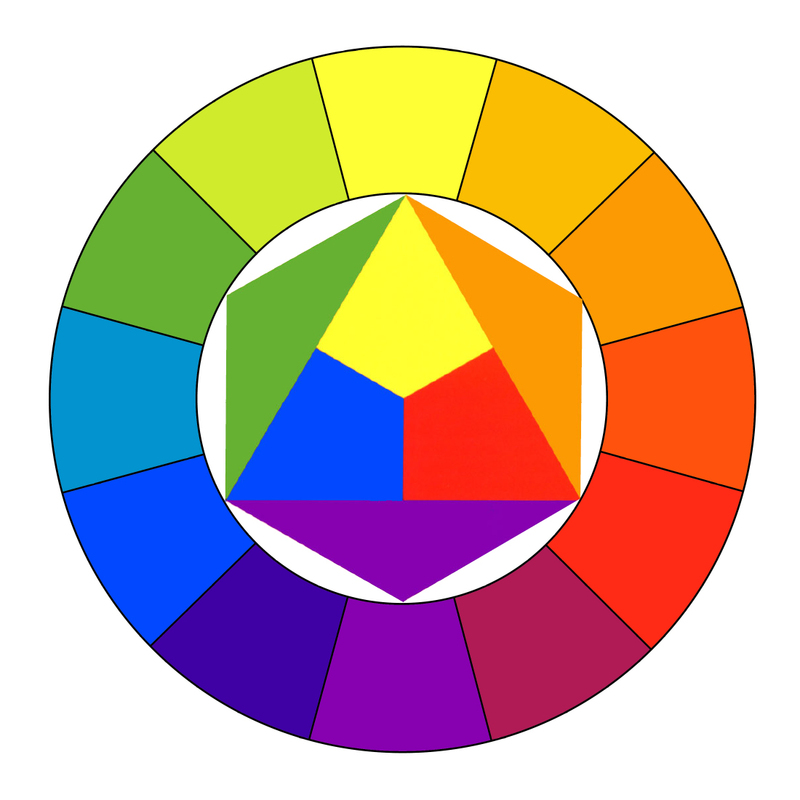 There are only two hexads in the colour wheel, namely: yellow/violet/orange/blue/red/green and yellow-orange/blue-violet/red-orange/blue-green/red-violet/yellow-green. 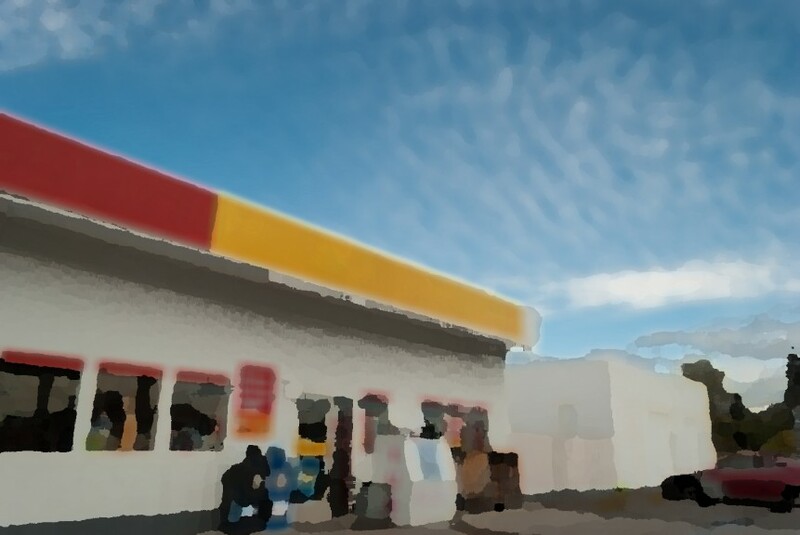 I was at a gas (petrol) station (fig. 09) in the rural area near the US border and just happened to look up to see these beautiful clouds in the blue sky and the contrasting red and yellow fascia board. I immediately grabbed my camera, dropped down next to the truck to get down low and took a couple of shots. The blue sky is grounded in the centre of the frame by the blue newspaper stand and shield on the door to the shop. The red of the fascia board is repeated on the trim of the windows and in the car in the lower right corner. The yellow is echoed in the parking kerbs and strip on the door. Colours that form an equilateral triangle within the colour circle are known triads. Red/yellow/blue is the best known one. Post-processing involved adding a tiny bit of contrast, clarity and vibrance and lifting the shadows ever so slightly. 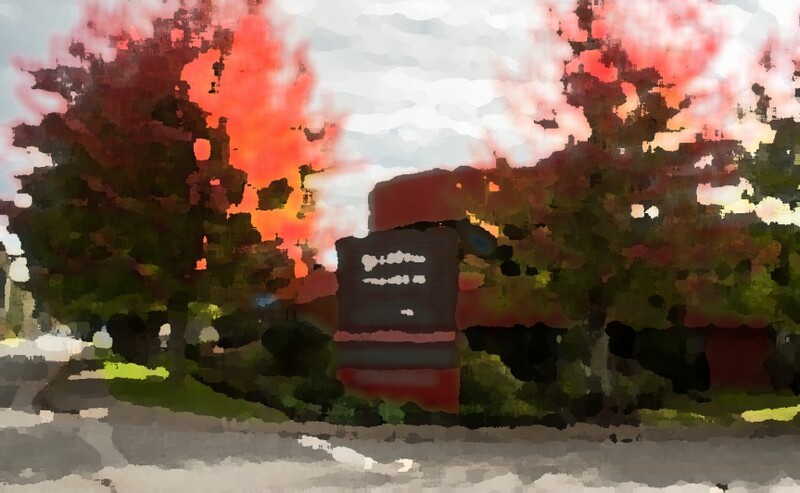 The image was then sharpened and luminance added. There is so much movement in this image (fig. 09). The clouds look like they are radiating away from the thick, white cloud just above the white building. The wide angle lens caused a strong linear perspective, which would probably have been more noticeable on the bottom had all those stands not been in the way. If I had included a bit more of the concrete in front of the shop this might have been a bit more visible, but I literally only had time to fire off two frames. The car provides a bit of inward movement to the photograph drawing the eye into the frame again. I happened to capture this image (fig. 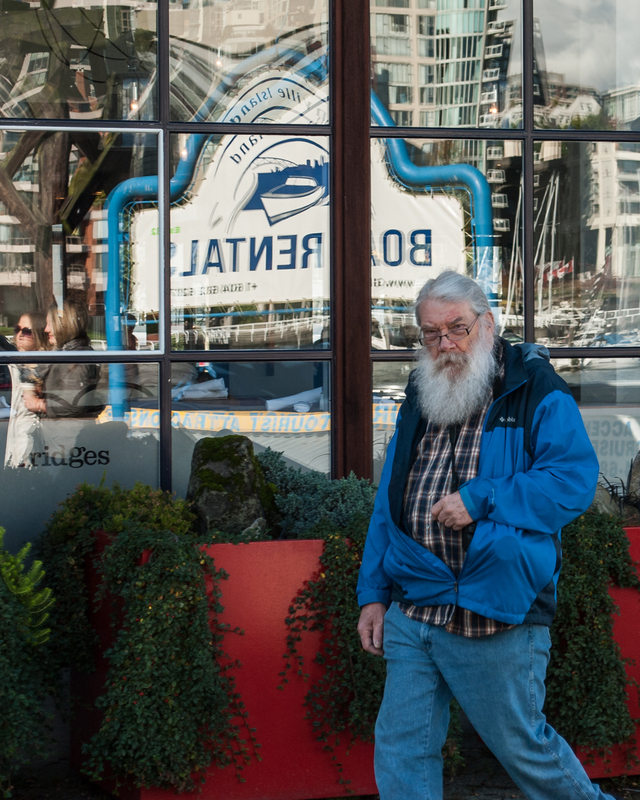 10) of another photographer on Granville Island (his camera is tucked away under his jacket – you can just see the lens poke at the jacket under his arm). It was actually the beard that drew my attention. He was walking past a restaurant and I immediately saw the blue-red-green contrast as he stepped past the red flower boxes. 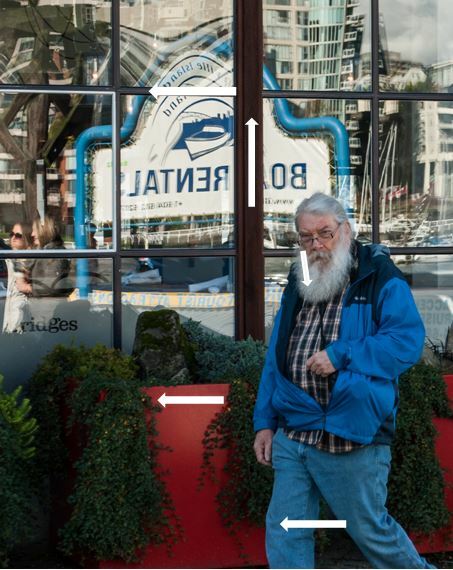 The reflection of the blue boat rental sign enhances his blue clothing. Just as red/blue/yellow in what is known the painters’ primaries is a triad, so too are red/blue/green triadic primaries in the digital world i.e. the world of transmitted light. In post-processing I added a tad contrast, lowered the highlights a bit and opened the shadows slightly and added quite a bit of clarity. I also sharpened and added luminance. The obvious movement in fig. 10 is the direction in which the man is walking, namely camera left. His eye-line is directed straight out of the frame, at me I think, judging from the expression on his face. The horizontal and vertical lines of the window frames are echoed in the building in the window’s reflection. The slight diagonal line of the red flower box provides a sense of movement that enhances the subject’s walk through the frame. While downtown one weekend I found a colourful blue entrance (fig. 11) and decided to wait and see who would walk by. 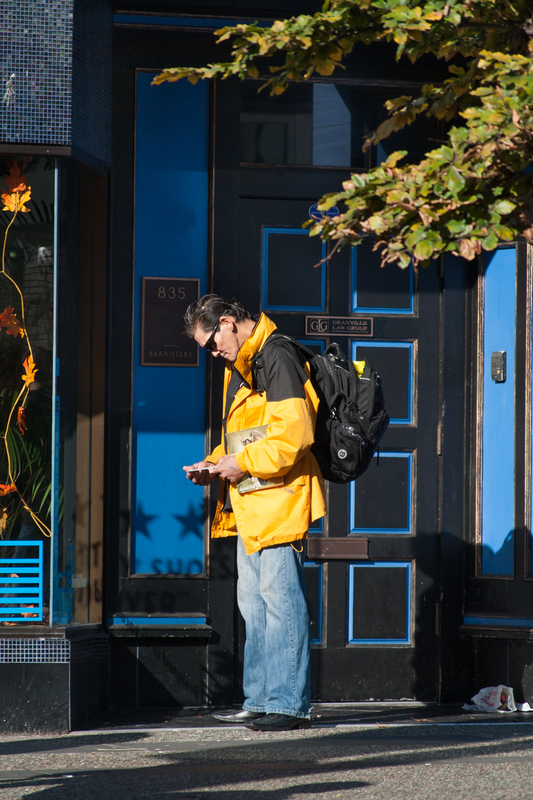 After a while this gentleman dressed in a bright yellow parka stopped in front of the door long enough to read his text messages on his cell phone providing quite an interesting shot. The blue/yellow contrast is a cold/warm contrast, the colours are separated by three other colours. Blue is a recessive colour, while yellow advances. In colour psychology blue is regarded as the colour of trust, honesty and loyalty and it also relates to one-to-one communication, while yellow denotes happiness and illumination. In post-processing I opened the shadows a fair bit and added vibrance. Then I performed some local adjustments on the door to raise the exposure and open the shadows a little more so the details of the door could be seen. Even though the subject in fig. 11 is stationary, there is movement in the diagonal branches of leaves coming in from camera right and their corresponding diagonal shadow on the pavement below. 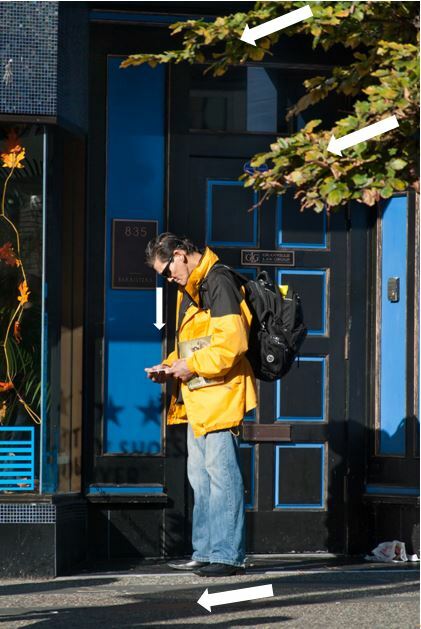 The subject’s eye-line is directed down to his cell phone in his hands. 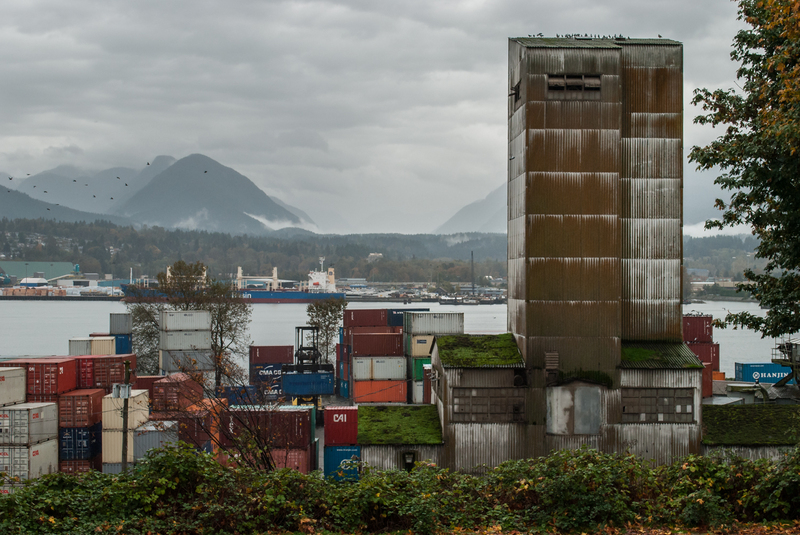 On a hill, overlooking a warehouse with some kind of silo, I came across this collection of containers at the docks (fig. 12). The view from where I was standing was over the harbour, looking at the mountains on the North Shore – another rainy day. The colours in this photographs can be classified as a tetrad, ie two pairs of complementary colours which would form a square or rectangle if we were to connect the lines between them on the colour wheel. In this image we have orange/blue and red/green. While the blues in the photograph are about the same intensity, the reds vary in tone from a bright red to the rust red on the silo. The orange is also fairly consistent, but the green varies across the gamut as well from emerald green moss on the roofs to the dark green of the maple tree on the right to a less saturated green in the shrubbery in the front of the image. The green of the mountains has been rendered to a grayscale by the atmospheric conditions. Within this tetradic contrast there is a further contrast of cold/warm. The blue/green (cold) contrasts with the red/orange (warm). In this image I added some contrast to counteract the flat lighting, took the highlights right down to bring out the details in the sky, opened up the shadows and added clarity and vibrance. I also performed a local adjustment on the sky to bring the exposure down some more and added a radial filter to the silo. The photo in fig. 12 offers a vertical movement up the silo tower and an undulating movment across the mountain range in the distance. 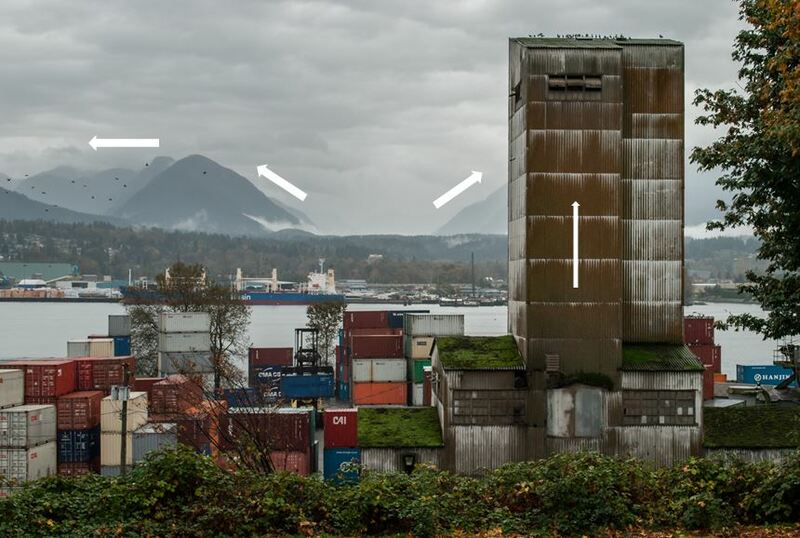 The stacked containers in the foreground are rectangular in shape providing a solid sense of stability to the image. When I turned around from shooting fig. 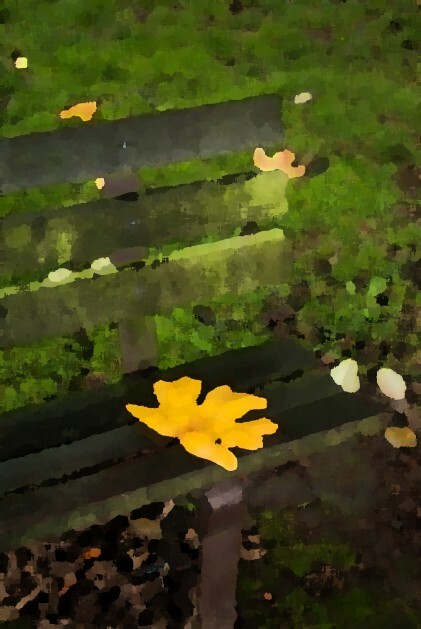 12 and started walking up the hill, I noticed a rain, sodden moss-clad bench under a maple tree (fig. 13). 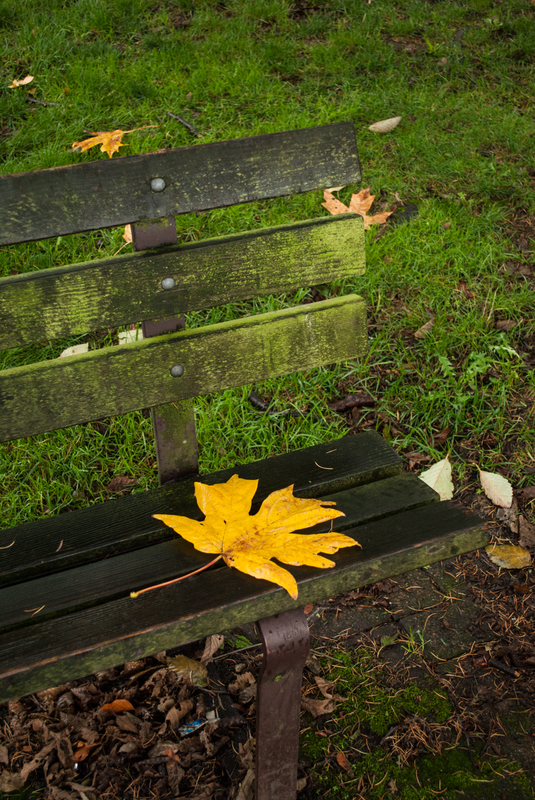 The analogous green of the moss against the bright green grass got my attention and I placed a big yellow maple leaf on the bench (realistically some of the leaves from overhead would have fallen down onto the bench at some time during the fall, so I am treating this image as my still-life). 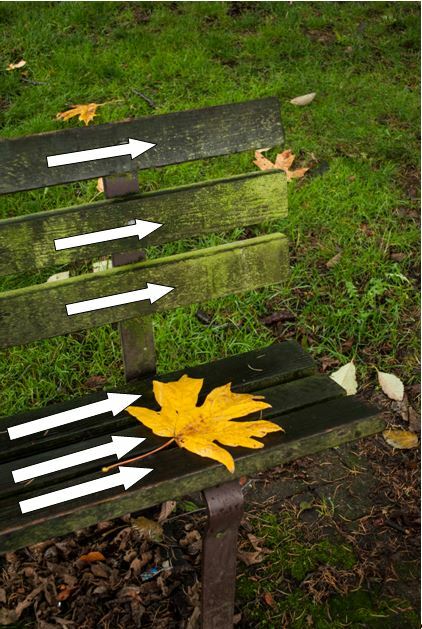 The yellow of the maple leaf adds a perfect tonal contrast to the greens of the bench and grass, making the mossy slats of the bench pop. In post-processing contrast and clarity were added and the shadows were opened up a bit. The movement in fig. 13 consists of parallel diagonal lines leading the eye in from frame left. 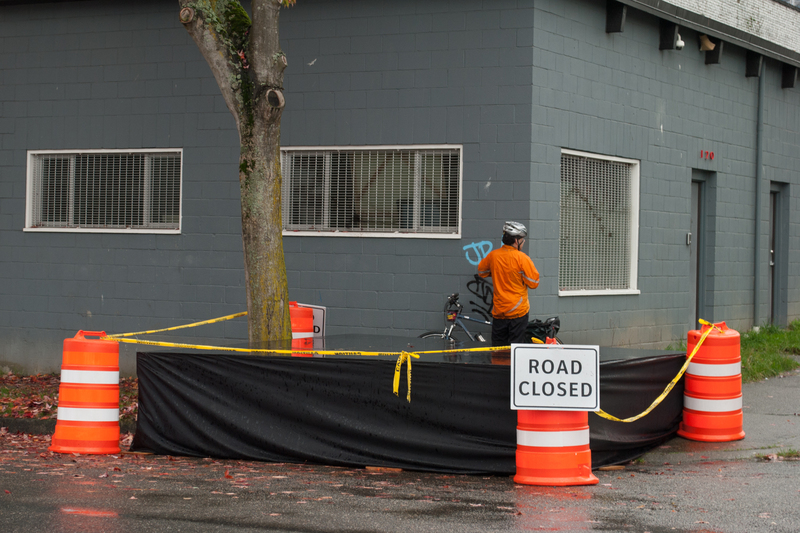 These orange cones immediately attracted my attention in one of the Vancouver alleys and just as I was framing my shot a cyclist rode into my frame (fig. 14). I waited for him to cycle through hoping to press the shutter before he passed the tree. Instead he stopped and got off his bike. Not knowing how long he would be there I took the shot anyway. I think it definitely works better having a live body in the shot and him having an orange jacket on was a bonus. The orange cones and jacket create very bright accent points against the grey building. The only post-processing done on this image was to bring down the highlights and exposure and tone down the saturation of the Road Closed sign, but still keeping it white. In fig. 14 the cones provide a circular movement around the cordoned off area. The yellow tape creates a movement from camera left to right to the Road Closed sign and then gives an undulating curve to the next cone. The man’s eye-line is looking up the road to something out of the frame. 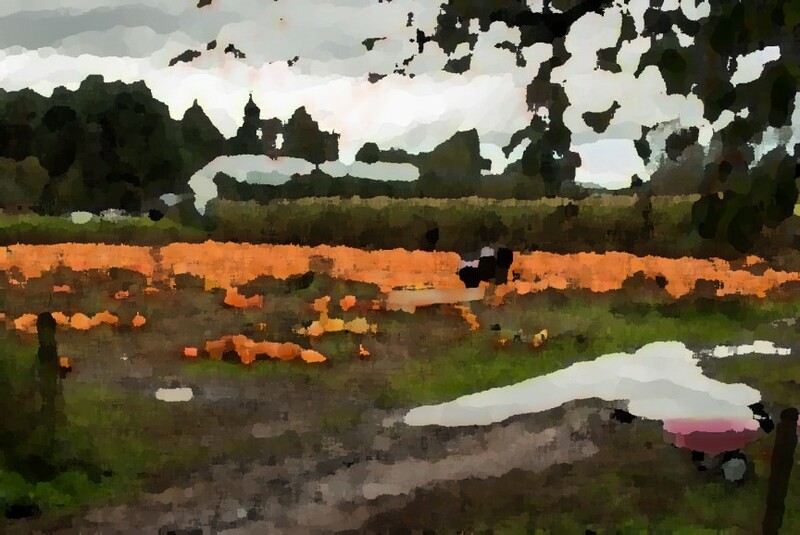 Out in the country side just before Halloween this the pumpkin patch lent a few photographic opportunities (fig. 15). I immediately noticed the bright pink wheelbarrow on the side of the muddy path and composed so that it would be in the corner of the frame. The bright pink creates a garish contrast to the orange pumpkins. Orange and pink are not really colours that I would put together. This might be because pink lacks the intensity in colour that the orange has. Post-processing involved adding a bit of contrast, bringing down the highlights sufficiently to pull the details out of the sky, opening the shadows a bit, adding clarity and vibrance. The movement in fig. 15 is mainly of a diagonal nature. 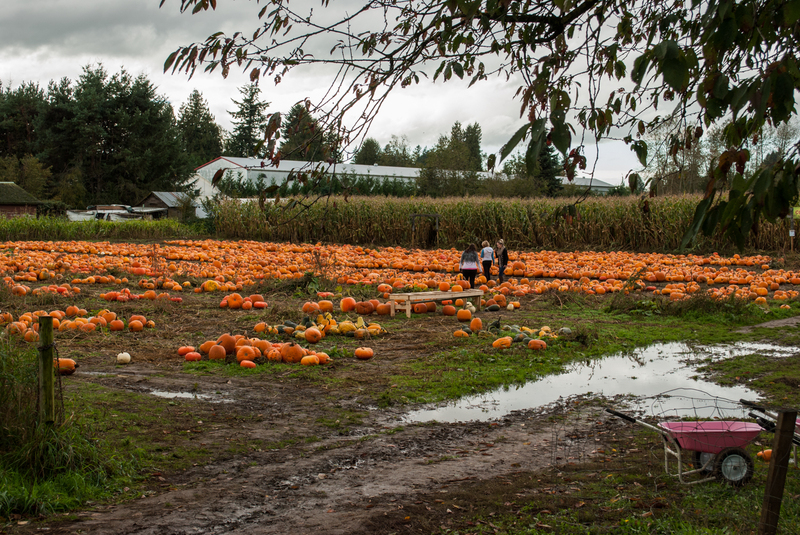 The muddy road leads into the pumpkin patch from the bottom left corner. The rows of orange pumpkins lead the eye across the frame diagonally. 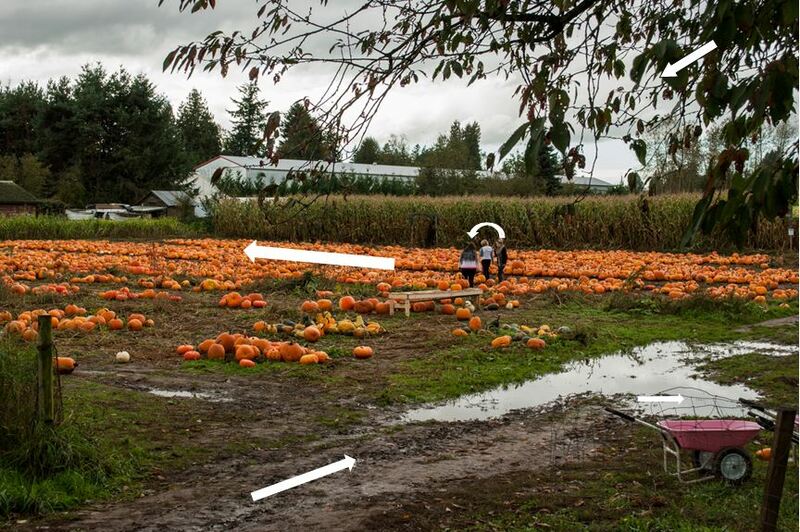 There is a bit of a circular motion in the stance of the three women in the field who are searching out a pumpkin to take home. The tree framing the top right hand corner also leads in with diagonal lines drawing focus to the pumpkins, while the pink wheelbarrow tends towards the right. What first drew me to this scene in fig. 16 were the shadows on the green corrugated building and the interspersion of light on the ground under the trees. This is a light-dark contrast. The red and yellow circular sign and the man’s red shirt in the lower right of the frame provide a pleasant accent contrast. I think because of the second red accent point, the yellow circle which is behind the red circle tends to decrease in significance slightly and it is the red colour that pops out against the green. Post-processing involved increasing the exposure overall by a third of a stop, adding a bit of contrast, reducing highlights a bit, opening up the shadows and adding clarity and vibrance. Local adjustments were on the green building to lower the exposure there and bring in a little more contrast to emphasize the corrugations on the walls. Around the parking garage I bumped up the exposure by a third stop and opened the shadows a bit more. I also increase the exposure on the red shirt. I brought down the exposure on the grey building in the background brought down the exposure on the recessed area on the left of the frame. 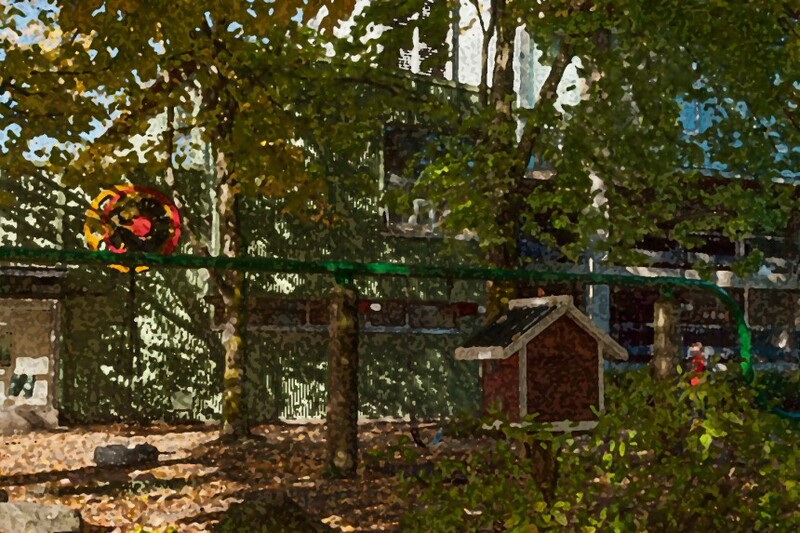 The branches of the trees and the resulting shadows provide diagonal movement throughout the image. The only circular movement is that of the sign and the curve of the pole on the right of the frame. 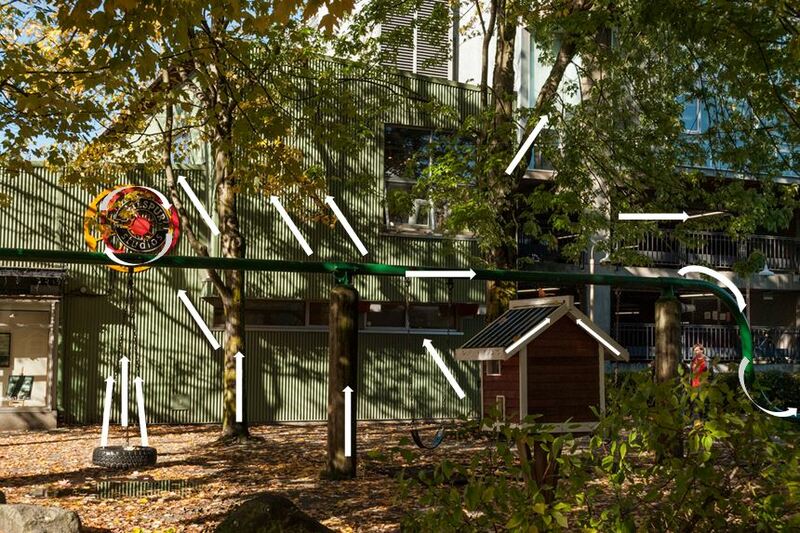 The bird house in the foreground and the chains of the tyre swing provide converging lines in the shape of implied triangles. I used my 18-55 mm and 55-200 kit lenses for shooting this assignment. I have varied my techniques using short exposure times as well as long exposures, shooting landscapes, urban scenes, candid street photography and abstracts. I am definitely taking more time setting up a shot than previously, thinking more about the composition and the flow of the image. For the most part I have cropped very little and only on a few images mainly to get rid of a distracting element. Overall I think I am happy with the photographs. I would have liked to improve on my people photographs as I don’t think they are as good as they could be. I have posted some of my rejects on my OCA Flickr album for comparison purposes. I think I have applied the knowledge of colour well and my work is presented in a simple, straight forward manner. I certainly have a greater appreciation about the subject of colour, never having ever had an inkling that it was so involved. I think I have communicated my intentions fairly well. I’m still battling with the conceptualisation of my thoughts though. I have tried to base this assignment along the lines of Eggleston’s Democratic Forest. I had to be fairly creative in coming up with ideas for shooting in the rain and I tried a variety of things like shooting through the car window to create abstracts. Unfortunately not everything made the cut, but I definitely benefited from the exercise and will continue to explore some of those avenues. From a creative point I think fig. 01, 07 and 08 are my personal favourites. With regards to my personal voice – I may be seeing snatches of something develop. I do know what I like photographing and don’t, but will continue to push myself in different directions to continue this search. I find that I have now settled comfortably doing the learning log and I have started to develop a better physical notebook. I started a new book with this assignment. My previous book sort of morphed into more of a written notebook which I was not too happy about. I spent a lot of time researching colour, finding more information than I could use. Johannes Itten’s Elements of Colour was my main reference text on colour. I also read a few journals and research articles. 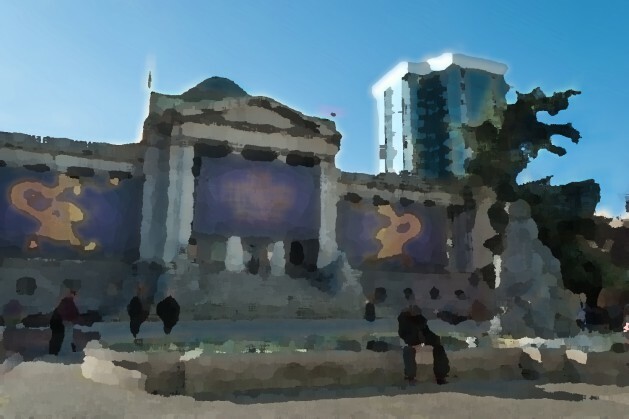 I have been to three exhibitions: Work is Art at the Gordon Smith Gallery of Canadian Art; the Karen Cooper Gallery and Bacchanal at the Art Works Gallery and have reviewed them all. I have watched the following videos to help me with this assignment: Light Fantastic: the Science of Colour and Colour Theory. The photographers I researched for this assignment were: Steve McCurry, Fred Herzog, Stephen Shore and William Eggleston (about his work, and two documentaries: William Eggleston in the Real World and William Eggleston, the Photographer) . I tackled Roland Barthes’ Camera Lucida, ploughing through it twice resolutely to gain some understanding of his writings. I do have to admit he had my poor brain in a knot quite a few times, but I think I managed to get a handle on the book. No doubt I will use it later and be able to build on my understanding of it. Little nuggets from the book have been coming to the foreground while I was working on this assignment, which I was pleased about. I attended a talk by young photographer, Jess Findlay at the North Shore Photographic Society, which I joined recently in order to build up contact with other photographers. Another interesting video I came across which will probably stand me in good stead when I get to level 2 was a TedxTalk about Bridging the self-acceptance gap with “psyphotology” which featured photographer, Peter Hurley and psychologist, Anna Rowley. I did not get as much reading done as I would have liked, Johannes Itten and Roland Barthes having taken up a lot of my time, but I do feel that the quality of the reading was perhaps better. I know there is a lot of reading ahead for Assignment 4 on Light and it will be slow going as it is of a more scientific nature. I’m hoping to add either Sontag or Berger to the list as well. Barthes, R. (1980). Camera Lucida Reflections on Photography. Paperback edition. New York: Hill and Wang. Itten, J. (1970). The Elements of Color. New York: Van Nostrand Reinhold Company. Ballard, Louise. (1964). The Art of Color by Johannes Itten. The Journal of Aesthetics and Art Criticism, 22(3), 344. Burton, David. (1984). Applying Color. Art Education, 37(1), 40–43. Burton, David. (1992). Red, Yellow and Blue: The Historical Origin of Color Systems. Art Education, 45(6), 39–44. Freeman, Michael (2007). The Photographer’s Eye: Composition and design for Better Digital Photos. Lewes, England: The Ilex Press. This entry was posted in Assignment 3 and tagged assignment 3, Camera Lucida, colour, Fred Herzog, Johannes Itten, Peter Hurley, Roland Barthes, Stephen Shore, Steve McCurry, William Eggleston on November 27, 2014 by lynda512863. I have to admit that I have found finding preparing for this assignment more onerous than the previous ones. I think it has to due with the fact that colour seems so deceptively simple, yet it is actually quite complex. My planning began with obtaining a good foundation in the subject of colour and to this end I read Johannes Itten’s The Elements of Color. This book is based on his book The Art of Color which was used in the Bauhaus as a reference text. The book has many exercises that build on understanding colour. I tried to do as many of the exercises as possible, but owing to the fact that the book is really geared towards artists, ie painters, there were a few exercises that I had to skip as I was not about to run out and purchase painting materials. The next step was to research photographers who make exceptional use of colour and I chose to research Steve McCurry, Stephen Shore, William Eggleston and Fred Herzog. I had initially intended to see if I could ‘recreate’ some of Fred Herzog’s scenarios by going to the same locations and photographing the area as it is now. I had managed to find quite a few of the locations of his photographs and thought this would be a very interesting exercise. However, the typical Vancouver weather set in and torrential downpours began making it impossible to photograph anything without risking my equipment. Some of the areas Herzog photographed are a little inaccessible in the fact that they are not car friendly – there is zero parking space in the streets these days (there was ample space when he roamed these streets). In between showers I managed to shoot in some areas nearer to home, but it was a little all over the place. 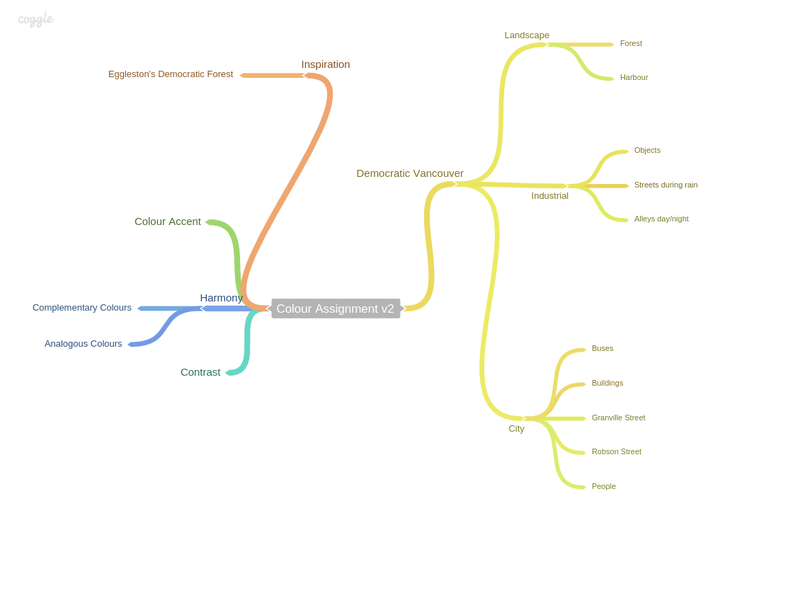 I looked at fellow students’ assignments and didn’t see much of a theme for assignment 3 in many of the blogs I looked at. I then began to wonder if a theme was necessary. It’s good practice for future courses to make connected bodies of work. As in Assignment 2 which investigates the compositional scaffolding that supports and enhances meaning in an image, colour relationships are another means of strengthening and supporting meaning in an image. Unless working in purely abstract terms the colour relationships should be subordinate to the meaning of the image but should enhance it. Something to avoid is making images that have no other intent than to demonstrate a specific colour relationship and be reduced to ‘this is a blue flower with a yellow flower’, ‘this is a red flower with green leaves’. 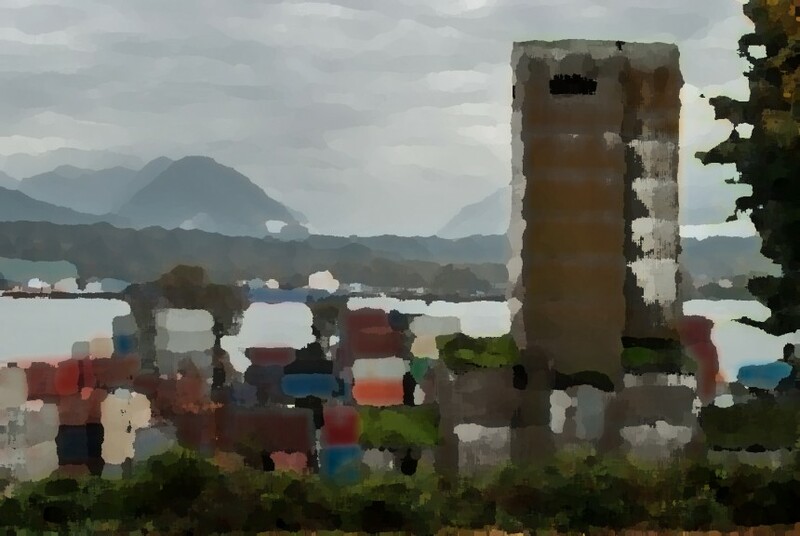 Working to a theme, say documenting your local shopping area, helps avoid this and gives purpose to the functioning of colour relationships in the course of making images with narratives that are essentially independent of their formal qualities. OK – so a theme was preferable. My planning was now totally out of the window and shot to pieces by the rain. I continued on with research and while researching Eggleston, became aware of how he made his series “Democratic Forest” and I decided to switch my theme to something similar by creating a series along the lines of “My Democratic Vancouver”. The plan may change slightly, but this is more doable given the crazy weather we are experiencing right now. 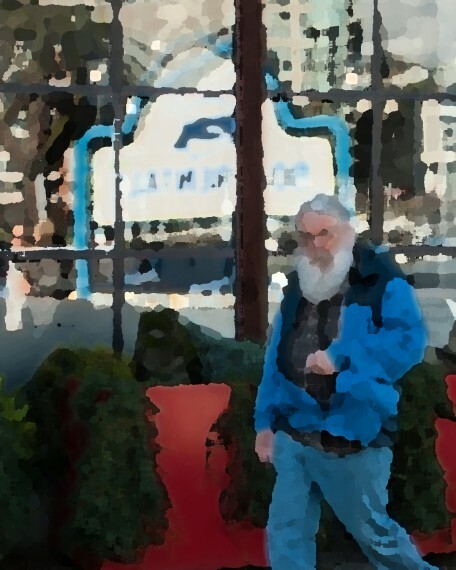 This entry was posted in Coursework, Part 3 Assignment - Colour and tagged CliveW, colour, Fred Herzog, Johannes Itten, Stephen Shore, Steve McCurry, William Eggleston on November 5, 2014 by lynda512863. Shortly after completing assignment two, I reviewed two documentaries on William Eggleston which was meant to serve as my starting point for my research on this photographer. This following review is a continuation of that. In 1965 and 1966 Eggleston began shooting colour negative film and later moved on to colour transparency film. His first exhibition in MOMA was curated by John Szarkowski and his accompanying book, William Eggleston’s Guide came out in 1976. In 1974 he discovered the dye-transfer process which was to become the hallmark of his photographs. At that time this process was only used in commercial work and Eggleston was eager to see how his every day life photographs would look in this treatment. I think it would be safe to say that he was blown away by the process. The Red Ceiling is so powerful, that in fact I’ve never seen it reproduced on the page to my satisfaction,’ … ‘When you look at the dye it is like red blood that’s wet on the wall. The photograph was like a Bach exercise for me because I knew that red was the most difficult color to work with. A little red is usually enough, but to work with an entire red surface was a challenge. It was hard to do. I don’t know of any totally red pictures, except in advertising. The photograph is still powerful. It shocks you every time. Critics were pretty brutal of Eggleston’s work calling it banal, snapshot-like and boring. Eggleston’s photographic subjects were and still are the people and streets of Memphis and Tennessee, the ordinary everyday objects one comes across like garbage on the street, children’s toys left on the pavement – in short – everyday life. John Szarkowski, in his introductory essay of the MOMA exhibition catalogue, ‘observed that the composition of most of the pictures seemed to radiate from a central, circular core. Eggleston replied: ‘That was true, since the pictures were based compositionally on the Confederate flag.’ . However, unlike the public’s snapshot photographs with small centrally placed subjects, Eggleston used the entire picture plane, thus drawing the reader deeper into the photograph, often adding partial details of people or objects along the outer edges of the frame, giving another layer of meaning to the photograph, thereby making the very familiar rather unfamiliar. Eggleston adopted what he called a shotgun approach to his shooting, where he would sometimes abandon the viewfinder and simply hold up the camera above his head and shoot from that perspective. This method, claims Eggleston, allows one to be freer and allows one to look around with more intensity. It also changes the perspective to that of a child or an insect and many of Eggleston’s photographs are taken from these positions. I think his best known photograph with one of these perspectives would be the Tricycle. He considers his camera to be ‘democratic’ meaning that every object has photographic value. He makes no distinction between things of beauty or those which are ugly. Everything is photographic fair game to him. I have found that Eggleston’s work grows on one. When I first viewed his work I think I had the same reaction that most of his critics had, but after looking carefully at his work and getting a bit of an understanding of the man, I find myself liking his work in general. His use of colours at times come across as rather bizarre or dark sometimes. His Red Ceiling photograph, for example, is as the man himself states, reminiscent of blood. (One has to ask the question – who would want to paint an entire room deep red anyway?) The self-portrait of Eggleston standing naked next to a bed in a black graffiti decorated room bathed in a reddish light has ominous undertones to it. One gets the feeling that a horror story is about to unfold. Eggleston chooses his colours deliberately, using brash colours that scream at one in some images and then switching to softer, mute colours in others. I became intrigued upon reading about Eggleston’s Democratic Forest series where the series takes the form of an imaginative journey, starting off from his home, going through various American towns and cities and taking him all the way to the Berlin wall and back home again. Along the way he photographed every kind of ‘scape: landscape, cityscape, streets, buildings, interiors, symbols of nature and symbols of globalisation and I realised that I had unknowingly also been doing something similar while looking for images for assignment 3. What I had been struggling with, however was to come up with a cohesive theme and this has given me a few ideas which will hopefully pan out by the time I need to submit my assignment. Most of all, you must resist seeing through the photograph to the bald image of a recognisable object too quickly, too readily. Instead, begin by looking at the form and the tight framing of the piece, the angle of view, the playing off of colour against shadow – that sort of thing. Otherwise, you will exhaust the imaginative possibilities of Eggleston’s work before you even begin. This entry was posted in Photograhers, Research and Reflection and tagged William Eggleston on October 30, 2014 by lynda512863. While researching Eggleston, I came across another documentary about him which takes the viewer into the daily life of this man. We accompany him and his son on various photo shoots, observe him working and interacting with his family. The narrator, Michael Almereyda, states that in John Szarkowski’s essay on Eggleston, Szarkowski states about Eggleston’s photos that “the world now contains more photographs than bricks …” Eggleston is a prolific photographer. He doesn’t hang around taking more than one photograph of anything that he photographs – he moves on. When working a scene he doesn’t reframe at all, just takes the shot as he sees it. Humans tend to be crowded out of his photographs, he rather focuses on objects. When asks by the narrator what emotions photography evoked in him, he simply replied that he had never thought about it. Eggleston’s own words about art: “Love it or appreciate it, but you can’t really talk about it.” He is truly a man of few words (well that is the way he is depicted in the documentary). When accepting the Getty Museum’s Lifetime Achievement Award all that he said was “Well, I’m glad I came here tonight. Thank you” and then returned to his seat to continue eating his dinner. The documentary is a little slow, but worth a viewing and it is extremely interesting to see the way Eggleston works. William Eggleston in the Real World. [ webcast]. Arthouse Films. Keep Your Head and High Line Productions, UK, 18/11/2005. 1 hour 24 mins 43 secs. https://www.youtube.com/watch?v=Lq3N2KWAttU (accessed 17/8/2014). This entry was posted in Multimedia, Research and Reflection and tagged documentary, William Eggleston on August 18, 2014 by lynda512863. An interesting short documentary in English (first half) and German (second half) on William Eggleston, a pioneer in colour photography. He describes his photographs as being about ‘life today’. He fostered a personal work discipline early on as he did not like to edit down his photographs. So he decided only to shoot one frame of any particular subject and this he still does. Eggleston is self taught, but was heavily influenced by Cartier-Bresson. His trademarks are the motifs that he places around the edges of his frames and also the drastic cropping of people. He preferred to use natural light. People are not regarded as subjects in his photographs, but rather he reduces them to colour or form – they become part of the composition. He states in the documentary that the colour red is very difficulty to work with, but he is not sure why, possibly because it is at war with all the other colours. He enlarges his photos and uses a dye transfer process that was more commonly used by commercial and fashion photography. This is characterized by a high degree of colour saturation, contrast and brilliance. By manipulating and exaggerating the colours, he creates a sense of artificiality and drama, rather like a painter would. His colour accents create sense of apprehension and unease, underlining the feeling of the uncanny in his pictures. A good insight into William Eggleston and well worth the watch. The English section stops at around 26 mins 11 secs. William Eggleston, Photographer. Reiner Holzemer Film [ webcast]. Published 2008. 52 mins 44 secs. https://www.youtube.com/watch?v=4O2Oz6lQ7bs (accessed 17/8/2014). This entry was posted in Multimedia, Research and Reflection and tagged William Eggleston on August 17, 2014 by lynda512863.